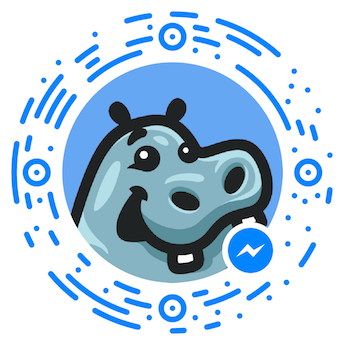 Message 'Hi' to 'CouponHippo' on Facebook Messenger to start saving. 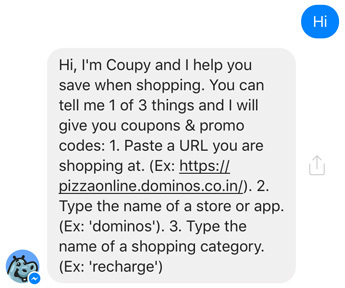 Coupy is the 1st coupon chatbot to help you save money without having to leave Facebook Messenger. What can I say to Coupy? What will Coupy say back? How to start talking to Coupy? If you message Coupy with one of the 3 previous items you will get back a list of helpful coupons to save you money. If Coupy does not know about the store or category you want you can vote for it to be added. 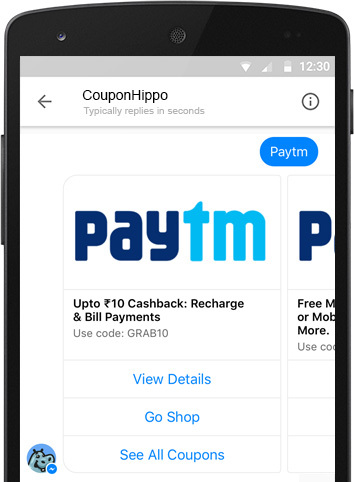 Coupy's most popular stores & apps are Dominos, Paytm, MakeMyTrip, Amazon and many more. Click to see the whole list. 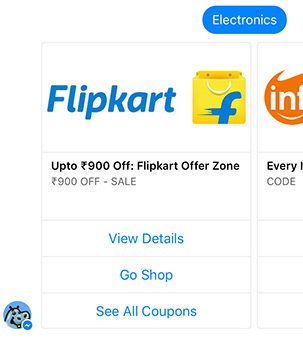 Coupy is the best money-saving Chatbot for Facebook Messenger in the US & India. It is always learning and getting better for you. It also uses AI to find deals nobody else can find. I found a bug with Coupy. How can I tell you about it? You can click the "Contact Us" link in the footer below. We will try to fix it quick and get back to you. Do you plan on expanding past the US & India? Yes! We are only in the US & India right now but have big plans to expand to many countries. Why is Coupy only for Facebook Messenger? Messenger is a huge messaging platform in India. The only one bigger is Whatsapp which doesn't have bot support yet. Basically, we want to serve as many people as possible with this awesome bot and Messenger is the best choice. 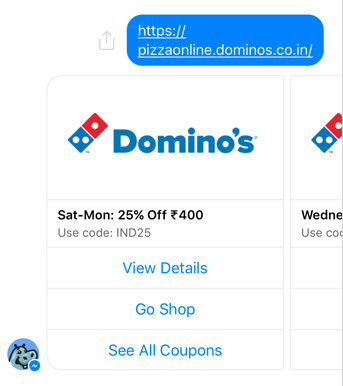 Please let us know by clicking the "Did Not Work" button below a coupon in Messenger. We try very hard ot only have valid promo codes on the site and would love you help.